Every GoCentral plan except Personal lets you add up to six PayPal buttons to your website. Use each button to sell a single product, or enable customers to donate to a cause you choose. Note: The eCommere plan's Online Store uses a different method for handling PayPal. 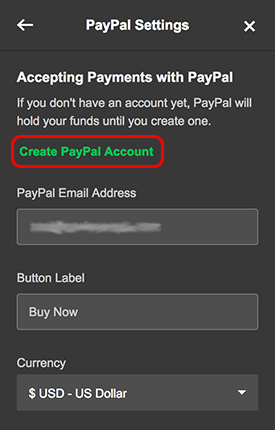 See Add payment method for how to have a PayPal button appear in the checkout screen. Scroll to where you want to add a PayPal button and click the plus button. When the Section Added confirmation appears, click PayPal Button to begin customizing its text, photo, and settings. If you don't have a PayPal account yet, in the PayPal Button panel, click PayPal Settings, select Create PayPal Account, and follow the prompts. Note: If you change your mind about adding this section, click Remove Section at the bottom of the PayPal Button panel.